Size: A: 2" x D: 18" x C: 30"
The Brian Hendricks Bobcat Easy-Set Face System from Van Dyke's offers new, innovative and functional features. The form has a pre-installed and pre-colored artificial nose; when using the custom earliners, there is no need to remove cartilage. With the Quick Eye Set, you attach the eyes to sculpted posts with clay, and align pupils. Once the eyes are positioned, slide the face piece into position and glue. The eye lid detail is pre-sculpted on the face - no need for clay or sculpting. The revolutionary new head design allows for easy hair pattern placement, and is a must for achieving an accurate Bobcat look. The rotating head and neck joint allows you to level the eyes regardless of the angle of the body. This Hendricks body is sculpted with true fluid action! 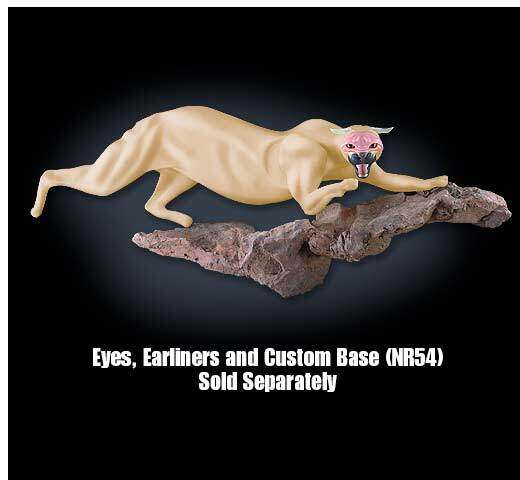 Recommended accessories for the Bobcat Ease-Set Face System are the F228BC Bobcat eyes, ERBC2 Cartilageliners and the NR56 base. 36" x 15" x 23"